This is going to be a serious post. 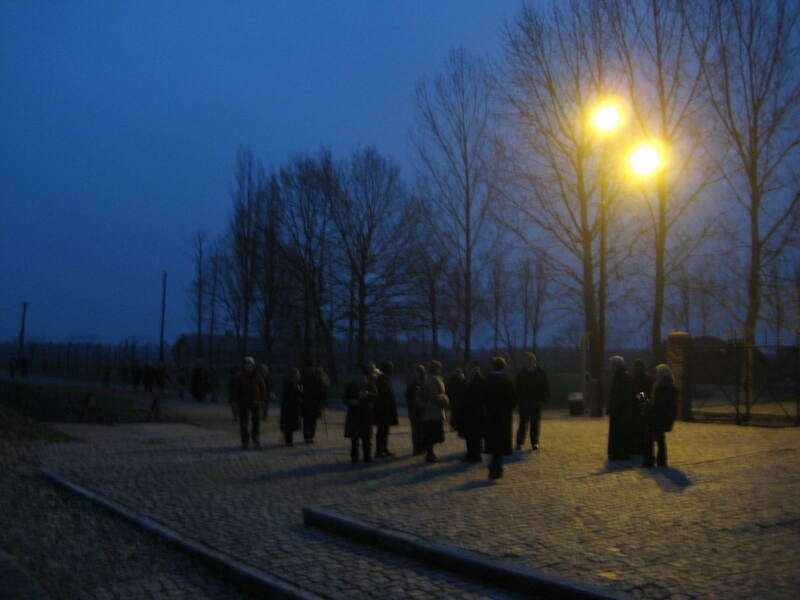 I want to tell you about my day in Auschwitz. And I’m going to treat the subject with the respect it deserves. First, a little back story. This was 2008. I was doing A-levels in Oxford. 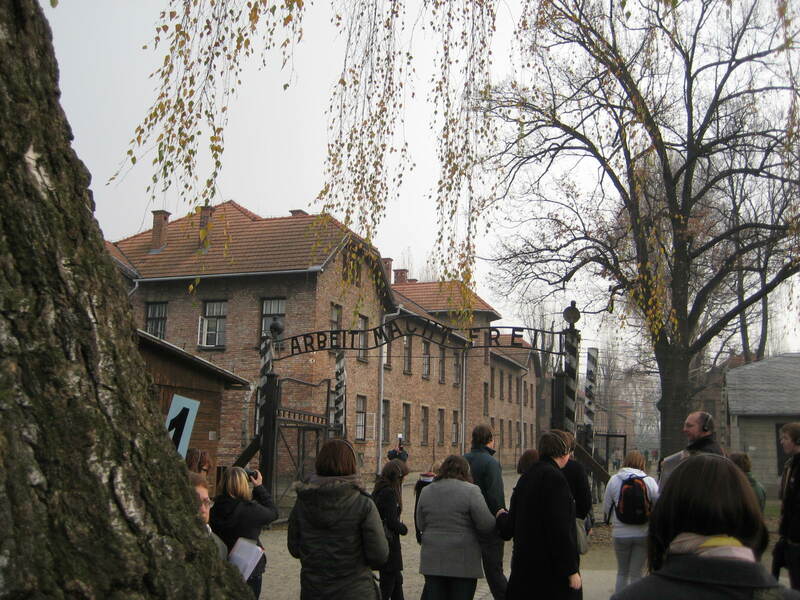 I had the fortune to be able to take part in a programme called ‘Lessons from Auschwitz’ organised by the Holocaust Educational Trust which, as the name suggests, aims to raise awareness of the Holocaust. If you’ve read An Educational Tale, you’d know I’m quite interested in that period of history. And so I was extremely excited to take part. One seminar down, I was ready to fly to Poland – for what I suspected, but did not yet know, would be the most memorable 24 hours of my life. November 13th, 2008: I left Oxford in the early hours of the morning with a fellow student and our History teacher. We were to join the rest of the group at the airport. The rest of the group consisted of students from other parts of the country and – fortunately for us – leaders of various religious faiths in the UK, amongst whom the Chief Rabbi, the Archbishop of Canterbury, and leaders of Muslim groups. This was going to be a special trip, as the sizeable bunch of reporters in tow suggested. 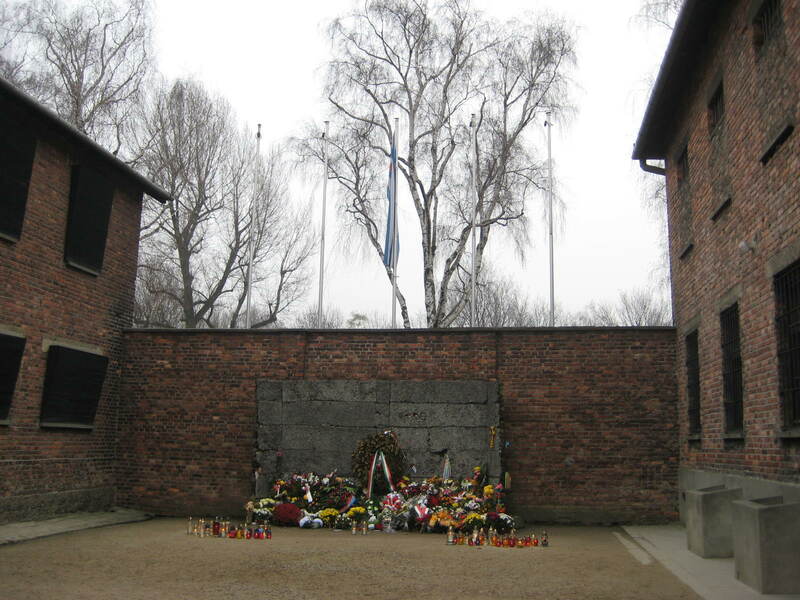 A few hours later, we arrived in Krakow, got on a bus, and were on our way to the town of Oswiecem, more commonly known by its German name – Auschwitz. 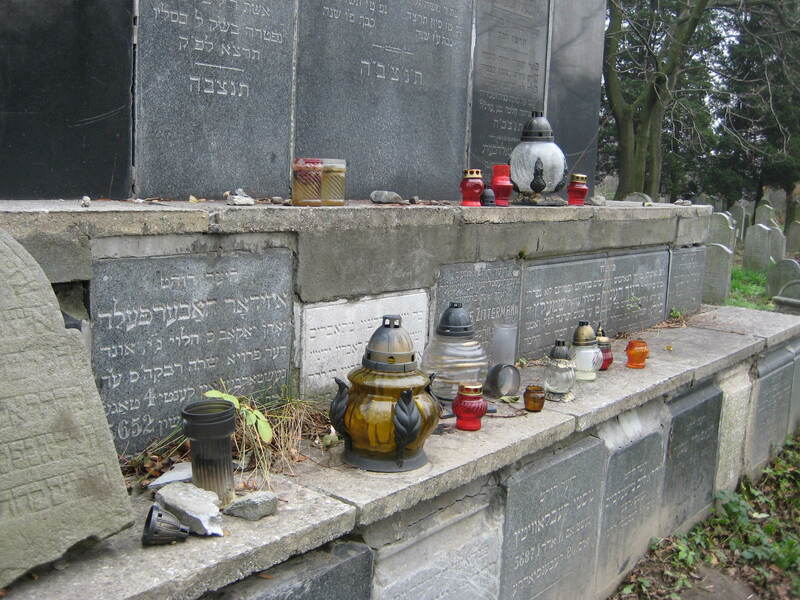 Our first destination: the Jewish Cemetery. 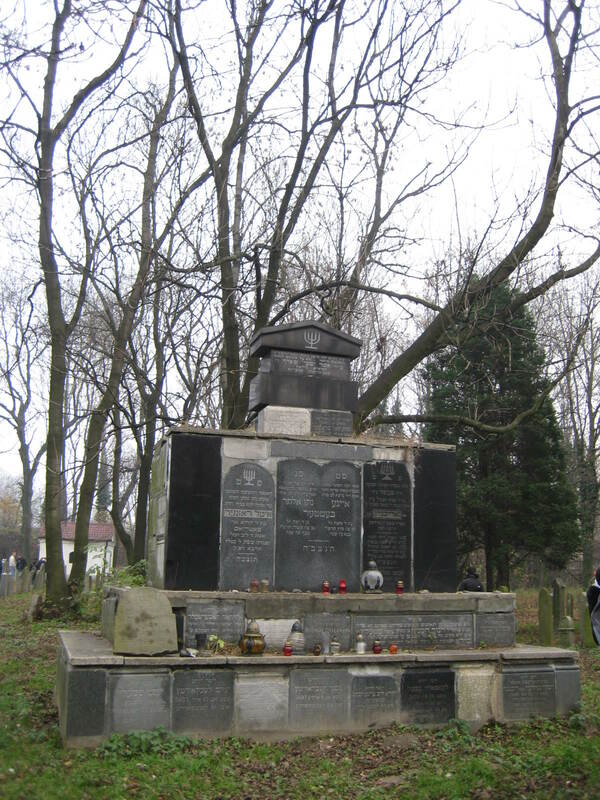 According to our guide, some years back they had to remove all the tombstones for fear of vandalism – anti-Semitism remains in the area, regrettably so. Afterwards, they couldn’t put them all back on the respective tombs, so they put the remaining tombstones together into a monument. 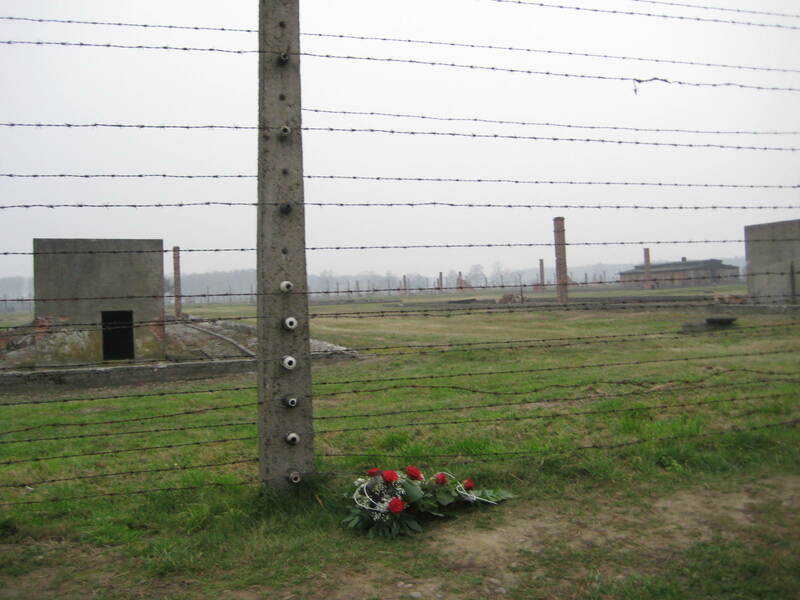 If I’m not mistaken, the last Jew living in Auschwitz died about a decade ago. He’s also buried in this cemetery. 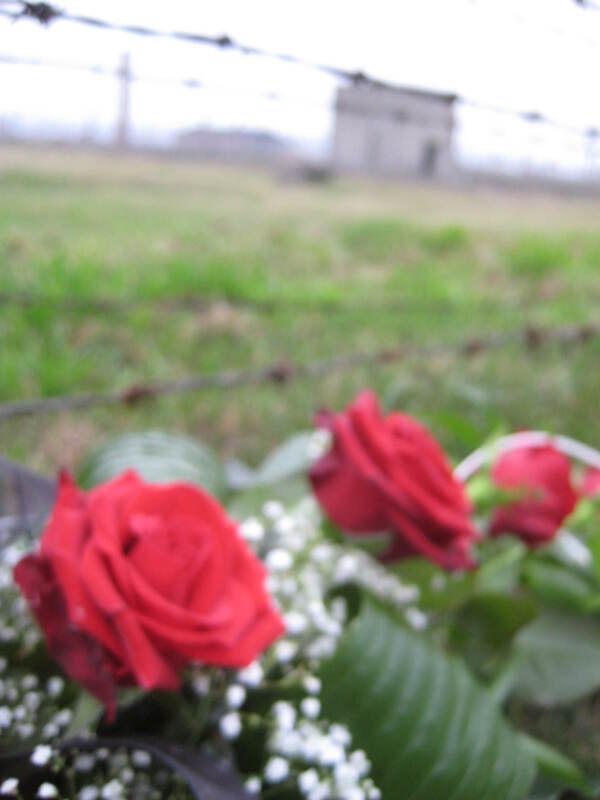 His grave is fenced. We were told to have a look around and do as we liked. Some took pictures. It was difficult. You’re never quite sure what photos are appropriate in a cemetery. I took the two you see above. 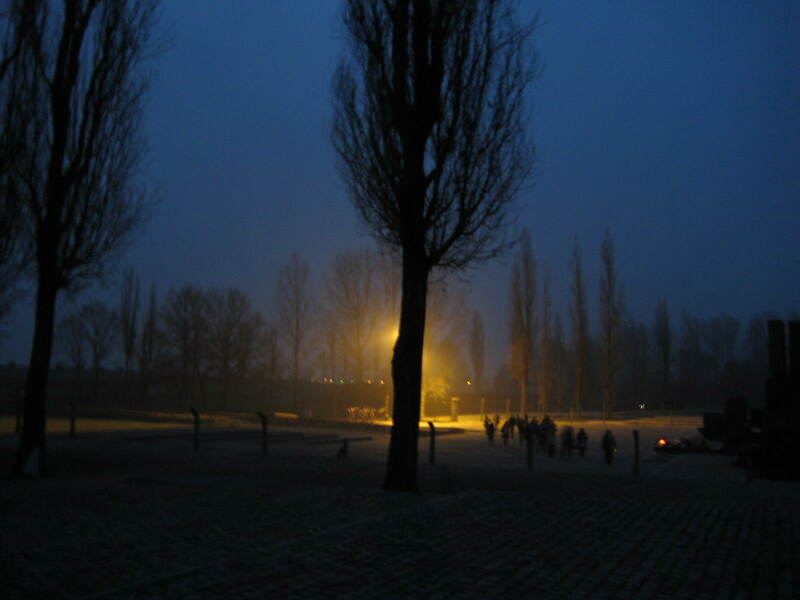 Then we got back on the bus and headed for our next and final destination: Auschwitz-Birkenau. 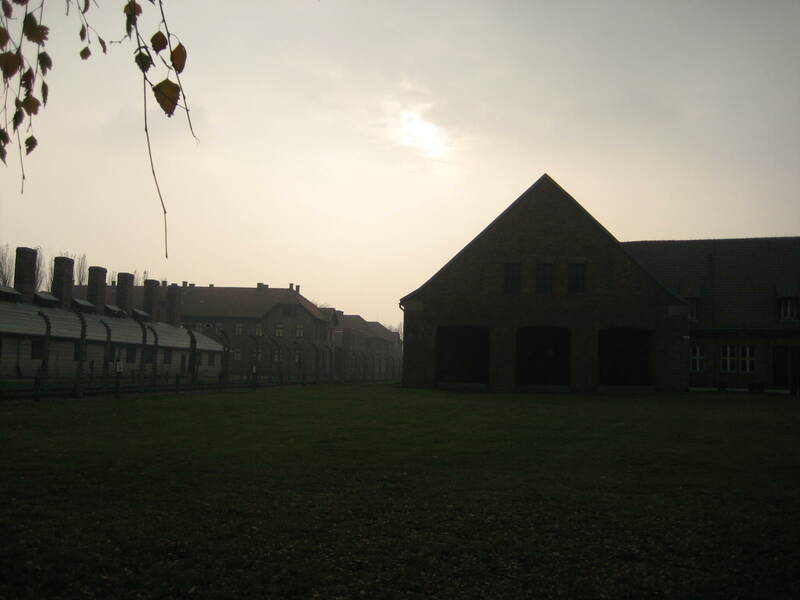 The most frightful thing about Auschwitz, I found, is how normal it looked. 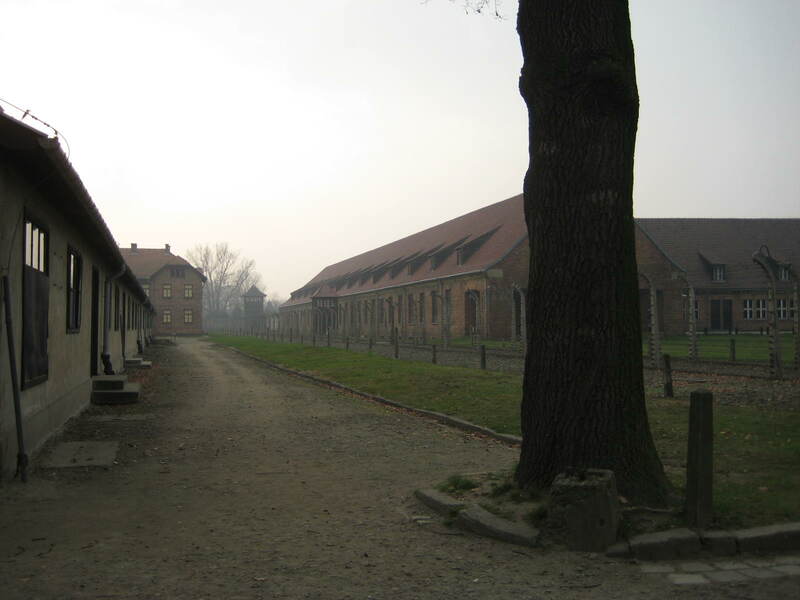 It could have been a boarding school. 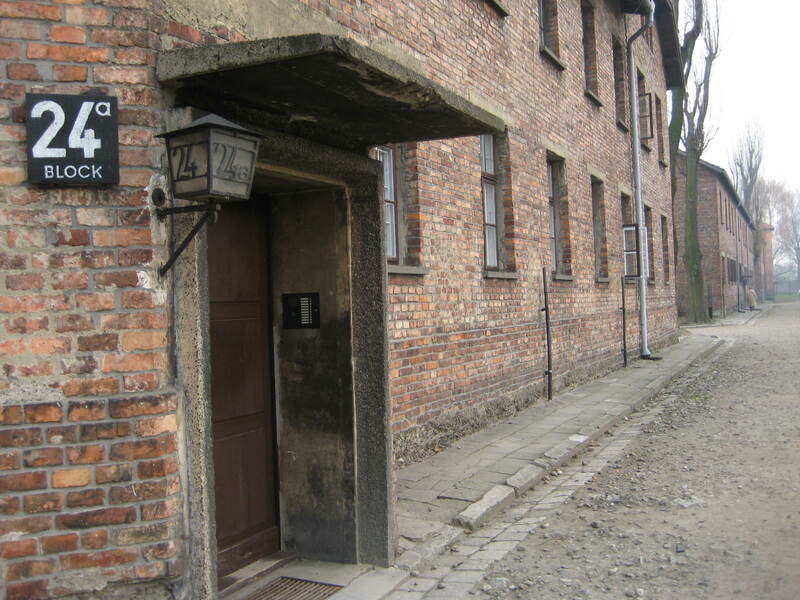 There are administrative buildings, and the blocks could have been classrooms. It’s frightfully ordinary. 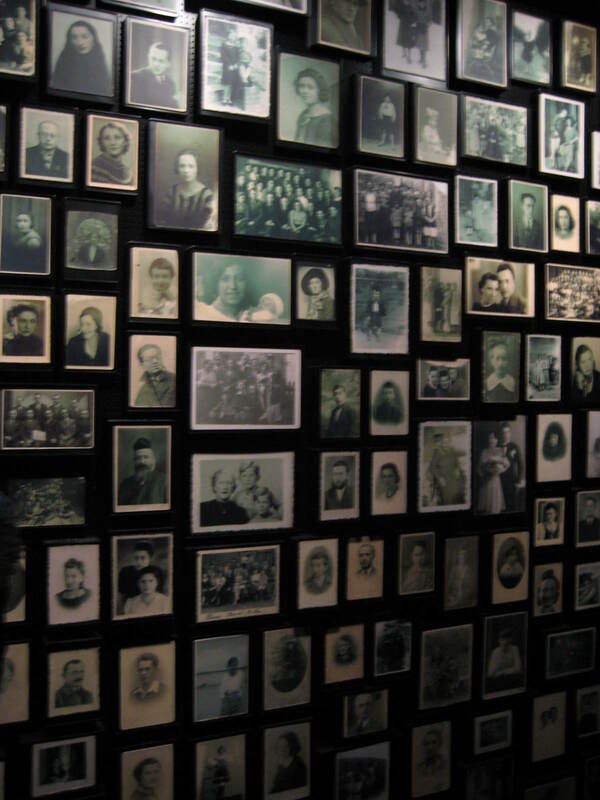 Everyone who has been to Auschwitz talks about the room with the hair. And no wonder they do. There is so much hair. You cannot imagine how much. And it’s not just the amount of the hair, but the impact it has on you, the images the mountain of hair conjures. I really cannot describe it in words, though I wish I could. More harrowing than the hair, I felt, was the shoes. I don’t know if it’s because I’m a girl, but the shoes left a deeper mark. Little girl shoes, leather shoes, heels, kitten heels. I spent some minutes trying to visually pair the shoes up, but there were too many. And they were too scattered. More than anything, they were too depressing to look at. And after a few minutes, I had to walk on. 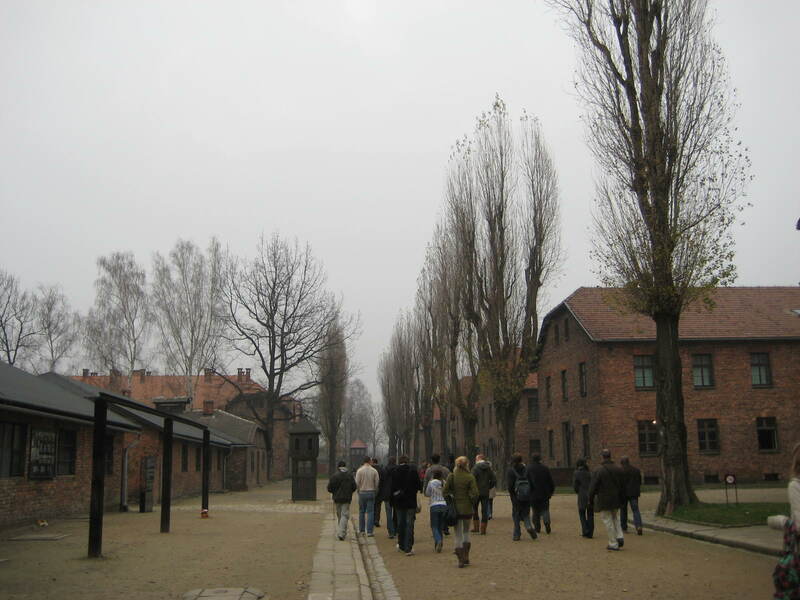 After some hours of a guided tour with commentary (through headphones), our visit of Auschwitz was at an end, and we made our way over to Birkenau. 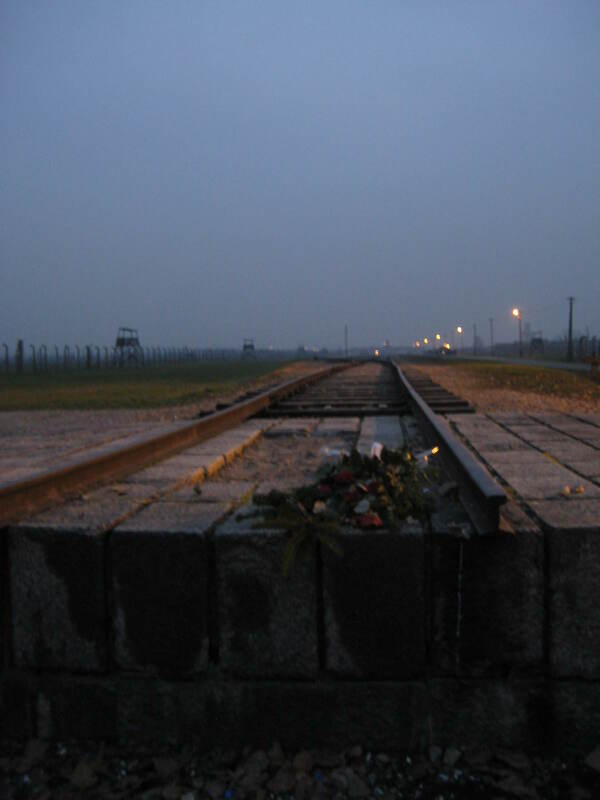 If Auschwitz left an indelible mark on my person, Birkenau left a hole in my soul. 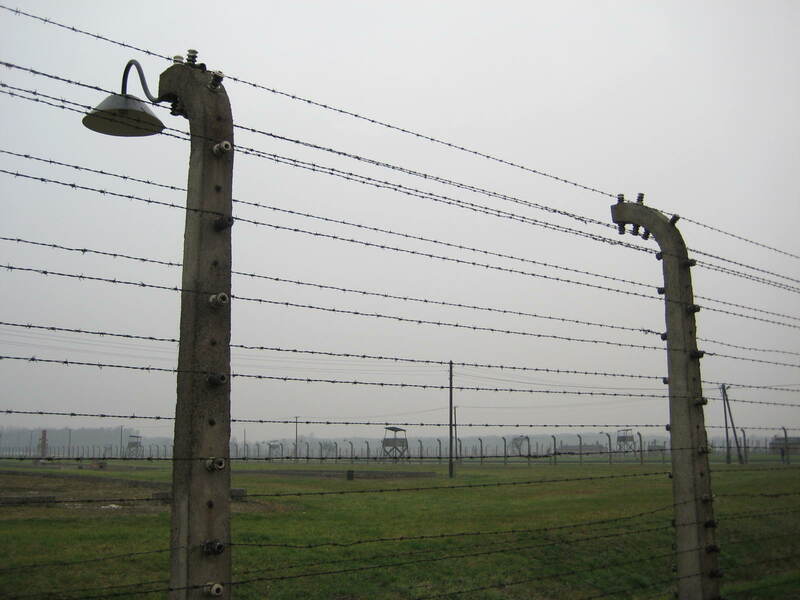 The gap between a concentration camp and an extermination camp is immense, unbridgeable – as I was soon to learn. Someone had left a bouquet of roses. We went up the watch tower. I’m scared of heights, so I was a bit apprehensive. But curiosity won me over. And I’m glad it did. 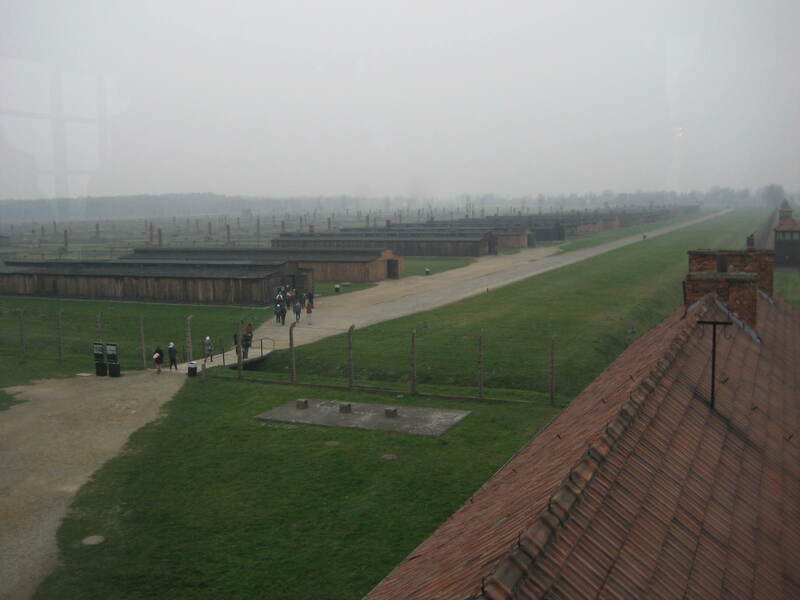 From the watch tower, you see the whole of Birkenau. And you cannot help but realise – it is immense. The green field stretches as far as the eyes can see, and beyond. 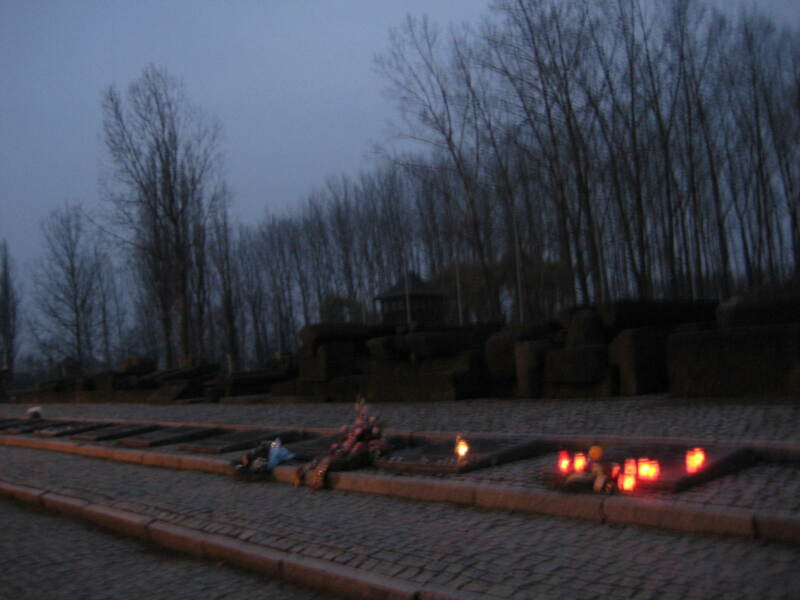 All the bunkers had been burnt down, but you can still see the concrete bases on which the bunkers once stood. And they spread on, and on, and on. 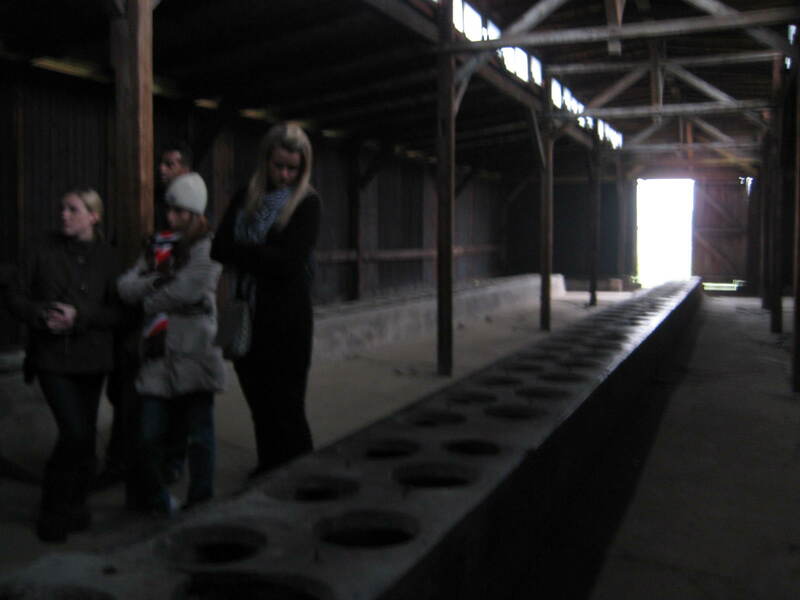 Some bunkers have been reconstructed for illustrative purposes, their interiors designed to simulate detainees’ living conditions. Somehow it felt wrong to take pictures, so I didn’t take very many. This was one of the few photos I took – the toilets. It soon grew dark. This being November, it also grew cold. At nightfall, we gathered to pray. The religious leaders who were with us led prayers in turn. Everyone lit a candle. 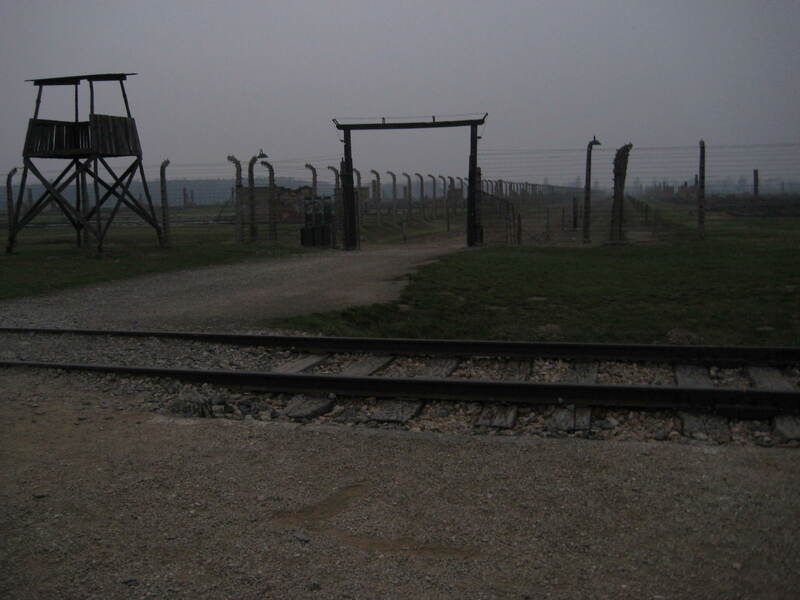 And we took a moment to think of all the lives that were lost here, not that very many years ago. Last up was the Chief Rabbi. He prayed and blew the shofar. I cried. I have never heard a sadder, more wishful sound in my life. And it cuts through you, sharp as a knife. Of all the things I saw, this was the hardest to see. Not pictures of the dead, but portraits of loved ones they chose to carry to what they most likely knew was their death. 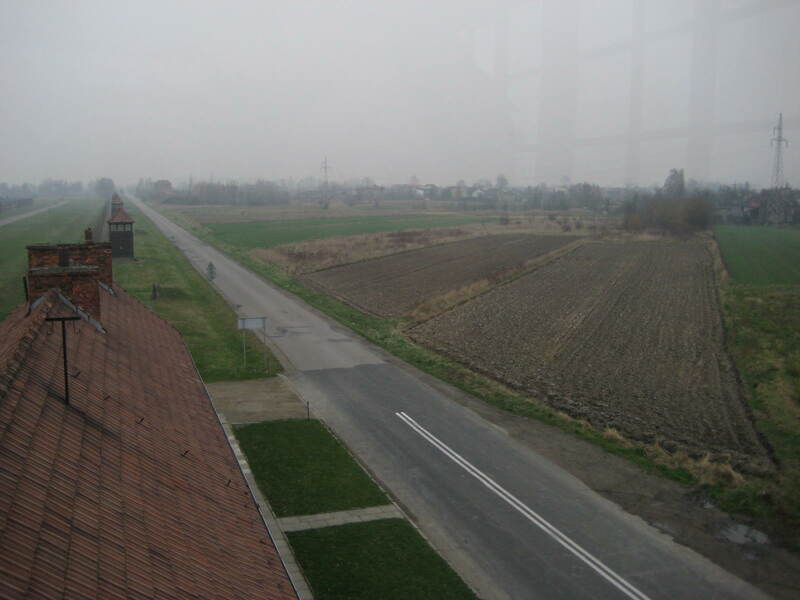 Then we left in the bus and headed for Krakow. 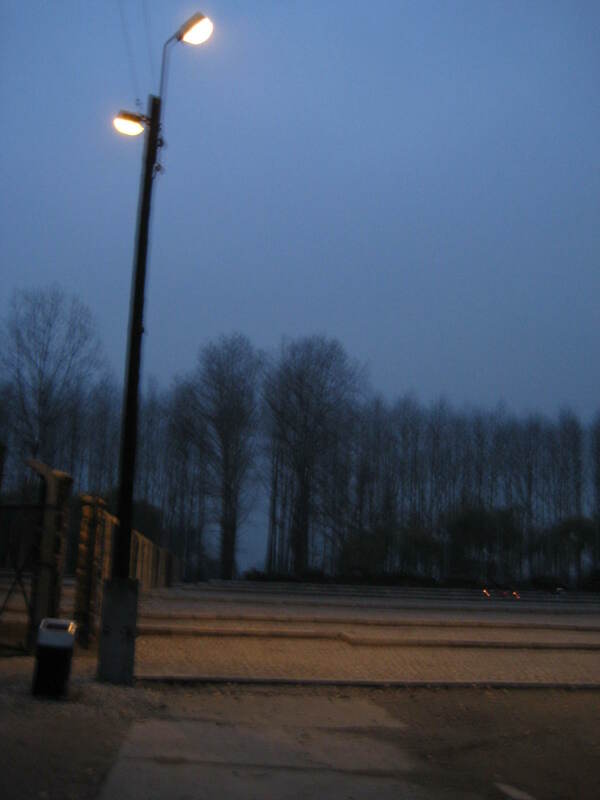 And by the early morning of November 14th, 2008, I was back home in Oxford. Up to this day, I can recall the whole day as vividly as if it had happened yesterday. As if I’d just got off the plane at Stansted. 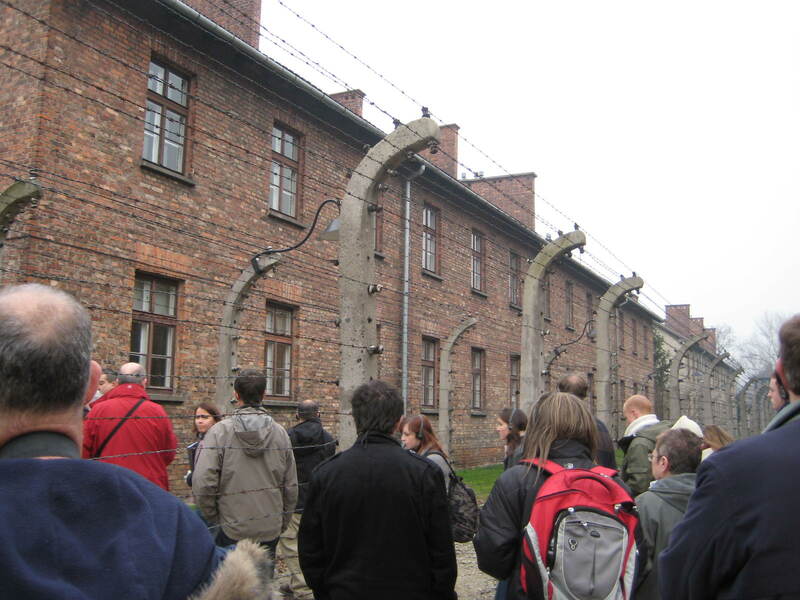 There is a lot of debate on the commercialisation of Auschwitz-Birkenau, about how and whether the memory of Jewish lives lost is being desecrated by profit-driven ‘Holocaust tourism’. I’m not going to go into it. I can only say that, having been there myself, I cannot but tell others to go. Go if you want to. Go if you can. You don’t have to be a history enthusiast. 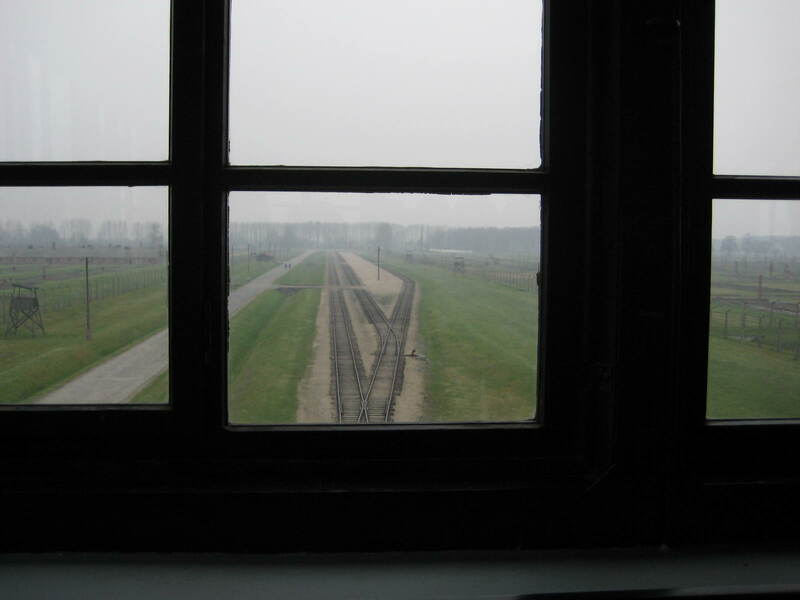 You don’t need to know much about the Holocaust to experience what I did. All you need is to be humane. And if you are – as I hope is the case – you will feel what I felt. You will learn what I did. And you will leave a better person. I cannot begin to imagine how it must have been for you. But you’re right, I think people should have a look, everyone should.